Do you want to backup and restore your phone data? Well, you are here so I can understand. In this post I am going to share best backup app to backup android phone. Below backup apps are free for any android user to backup Android device data. If you are going to format android mobile then you should use below backup app to backup phone data. I can know how much important data available in our smartphone like Contacts, Apps, Messages, Audio, Pictures, Calendar, Bookmarks etc. So I highly recommend you to use these backup and restore android app to backup mobile data before format (Soft or Hard or Reset). These backup apps will be helpful to backup installed apps and after phone backup you can share apps by using bluetooth without any transferring app like Xender, ShareIt. As you know there are lots of backup app in Google Play Store and other app store but problem is to find best backup/restore app in all of them. That’s Why, I have collected best backup app for you. Also Read: Top 15 Android Games (Addicted Game). Do you want complete backup and restore of your smartphone? Don’t Worry, These backup apps also help you in-app backup and restore. We Should regularly backup phone data because We can’t belief on Android phone. It may be corrupt or dead at any time. So Go ahead and backup your Android data now. Note: If your Google Play Store app is not working then Direct Download Apps without Play Store App. Below are highly recommended backup apps to backup and restore android phone. I personally used them. So let’s see bast backup apps. CM Backup App is one of the famous backup and restore App. 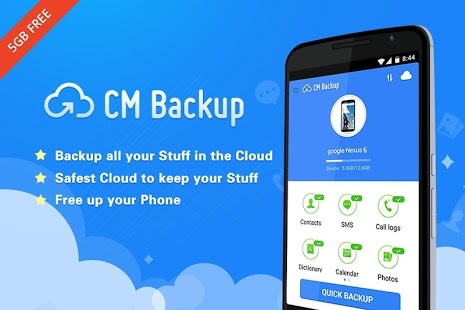 CM Backup and restore app is developed by Clean Master’s sister team Which is known as Cheetah Mobile. This app has been downloaded 5 Million till now and got 4.7 out of 5 Rating . CM Backup is not only backup in your SD Card but also it allow you to backup data in Cloud space up to 5GB for free. This app is help you in backuping contacts, messages, installed apps and photos. You can restore them when ever you want. It compress Photo size without affecting quality and backup them to cloud server. Easy Backup & Restore is similar super backup app of CM backup app. This app is developed by MDroid Apps. It has been downloaded 1 Millions and got 4.3 out of 5 Rating. This app will help you in backup and restore apps, SMS, MMS, call log, browser bookmarks, dictionary and contacts. You can backup data in your sd card. It gives another option to backup data. Use Dropbox, Google Drive, Box or OneDrive instead of SD card. Not need to root for backup and restore app. Titanium Backup app is most popular backup app in google play store. 10 Million Android user downloaded this app and given 4.6 rating. It support almost 31+ languages. This is most powerful backup tool. It has power to backup All apps, Phone Data and Market links. Use this app only if, you have rooted Android phone. Titanium Backup app is having much more features. Need help with Titanium Backup you can contact at www.titaniumtrack.com/kb . My Backup app is alternative backup app of the above app. There are 1 Million downloader of this app. My Backup app is use to backup all mobile data like text message, APK Apps, Gallery things, System setting, Calenders, Data migration support. If you are rooted android user then you can use this very well but non rooted user may not have access some features of this app. Helium is another Great backup apps which is having both Free and premium version. This app is also downloaded 1 Million times from android phone. This app is developed by ClockWorkMod. You can use Helium backup app to backup, restore and sync Android app. There is not need to have rooted mobile. Drop box, box, Google Drive Backup and restore. These are the best list of android backup apps to backup and restore smartphone data. I have already verified above backup app and used them. You can install them from Google Play Store. If Google Play Store app is not working well then read how you can direct download Play Store file from Browser or PC to download backup app apk file. I hope you are satisfied with these backuping apps. Let us know if you are using any other backup app in comment section.